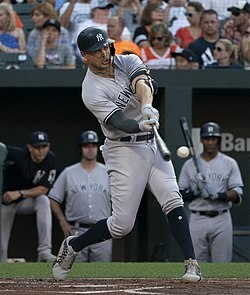 On April 1, Stanton was placed on the 10-day injured list due to a Grade 1 left triceps strain. ^ Frisaro, Joe (October 1, 2017). "No 60, but Stanton the HR, RBI king of 2017". MLB.com. Retrieved October 6, 2018. ^ a b c Witz, Billy (April 2, 2018). "How a Star Lost a Name And Found Himself". New York Times. p. D2. Retrieved April 2, 2018. 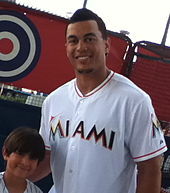 ^ "Stanton diagnosed with Grade 2 hamstring strain". MLB.com. Retrieved December 8, 2017. 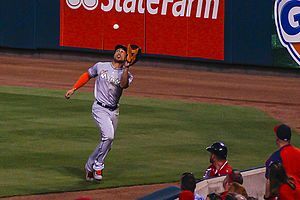 ^ "Giancarlo Stanton officially rejects trades to Cardinals and Giants". Retrieved December 8, 2017. 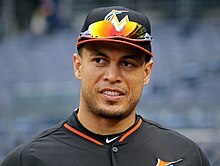 ^ "Giancarlo Stanton goes on IL with triceps strain". MLB. 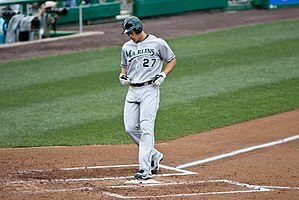 Wikimedia Commons has media related to Giancarlo Stanton.